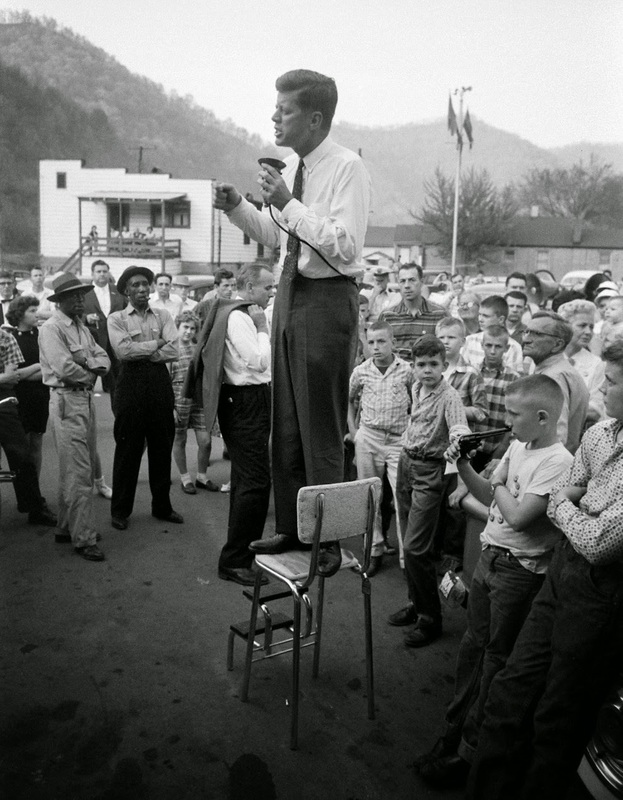 John F. Kennedy campaigns in rural West Virginia looking for support for the May 10th primary, precariously perched on a high-chair to deliver his speech, 1960. While part of every candidate’s retinue, security was simply not the pressing public concern in 1960 that it would suddenly and necessarily become within a few short years. Here, seemingly alone in a crowd in Logan County, West Virginia, JFK speechifies from a kitchen chair as, mere feet away, a young boy absently plays with a jarringly realistic-looking toy gun. JFK went on to win the West Virginia primary, with 61 percent of the vote. In many aspects this photo is a proof of how the times have changed. Simpler times, as noted by the entire scene. It’s amazing that he is campaigning to a mere 75-100 people. Back in the 1950s and 1960s candidates cared a significant amount more about regular folks and the value of a potential voter. Gone are the days of a presidential candidate making a speech standing on top of some nonsense, jury rigged, high chair contraption. Nowadays you could never see this, it will always be behind podiums (with fans) and pre-asked questions. Yes, that’s a toy gun in that little kid’s hand. Can you imagine this scene ever happening again with a modern day president? There’s a reason why the kid might have had the gun pointed at his own mouth. First of all it’s not just an ordinary toy gun, but it’s a squirt gun. The squirt guns existed before water bottles were commonly marketed, so the kid was drinking some water from his squirt gun, which was actually not a unheard of use of squirt guns, because, as stated, there were no water bottles. Kids were allowed to play with toy guns back in the day. Even at school or at public events. Toy guns were marketed as looking as close to real guns as possible. On November 8, Kennedy defeated Nixon in one of the closest presidential elections of the 20th century. In the national popular vote Kennedy led Nixon by just two-tenths of one percent (49.7% to 49.5%), while in the Electoral College he won 303 votes to Nixon’s 219 (269 were needed to win). John F. Kennedy is the youngest-ever elected president, aged 43. However, Theodore Roosevelt is the youngest person to ever become president. He was 42 when he succeeded to the presidency, following the assassination of McKinley. In 1968 toy guns were removed from the stores after the assassinations of civil rights leader Martin Luther King, Jr. and U.S. Senator, former United States Attorney General, and presidential candidate Robert Francis Kennedy. (Credit: Hank Walker, Time & Life Pictures/Getty Images). Times have definitely changed, without a doubt. Of course, this was a time way before I was even thought of being brought into this world, but I don't even have to be born then to see how much is different compared to today. It's always nice to run upon a bit of history when it comes to places you keep close to your heart, though. I'm always checking up on this site to see what new and fascinating photos I can see next. I love the kid with the cap gun in the lower right of the photo. I had a very similar toy gun when I was a kid. I imagine that people under 35 years old have a hard time believing that nearly every little boy had toy guns that looked like that up until the 1970s or thereabout. I can't get rid of the nagging feeling that there is a connection between banning such toy guns and the onset of mass shootings. They banned the toy guns after the assassinations. You can see how much good that did.